The Business Model Canvas’ chief virtue is its transparency, and that transparency helps create focus. That said, to create a meaningful and worthwhile take on the Canvas, you all want some depth. Here we’ll walk through 3 steps that will help you dig deep into what your business is about and how to frame that using the Canvas. The Business Model Canvas is a tool for articulating and innovating business models. It has the nine blocks shown below. You can probably sit down right now and fill out a version of it for your business. NOTE: click in the bottom right where it says ‘Google SLIDES’ if you want to link to the file to copy it. The item above is a Google Doc’s template. If you’re prefer something printable, here’s a PDF. The Canvas looks flat, but actually it’s not- it’s hierarchical. The relationship between ‘Customer Segments’ and ‘Value Propositions’ is the independent variable that should drive the rest of the Canvas. Given that, it’s worth spending as much time as you need here. When I work with students, I have them start by creating a set of personas, humanized portraits of their customers, be the buyer and/or user of the company’s product. Who are they? What kind of shoes would they wear? Can you think of five real-world examples? Which are most important? Personas vs. Customer Segments: Technically there’s a difference. Segmentation is a way of heuristically grouping sets of customers and personas is a tool for humanizing your understanding of them. I prefer working from the bottom up and starting with the personas- presumably, you’re doing the Canvas so you can peel back the onion and really look at what’s driving the business. If you find you have a lot and they fit into logical groups, then, sure, group them by Segment. But I wouldn’t worry too much about that at the outset. Located dead center in the Canvas, this is the nexus of your business model. I work through this by rewinding a couple of steps. First, what problem scenarios are important to your personas? If it’s a business to business proposition, what jobs are you doing for them and how do those need improving? If it’s a consumer proposition, what underlying needs and desires are you fulfilling? Once you get a list of full articulated Value Propositions, sort them in order of most to least compelling and record them on the Canvas. …and we have a VALUE PROPOSITION that’s better enough than they alternatives where the persona will (buy our product, use our site, etc). The Customer Relationship and Channels blocks are often given short shrift, but they tease out an important and often neglected area of your business model: creating an efficient, high quality customer journey. To think through the customer journey, I use a framework that’s over 100 years old: AIDA (attention, interest, desire, action). I add onboarding and retention to make it ‘AIDAOR’. Storyboarding is a great way to make sure you’ve really thought through this part of your business model. Below is an example for ‘Enable Quiz’, a fictional company I use in my curriculum. 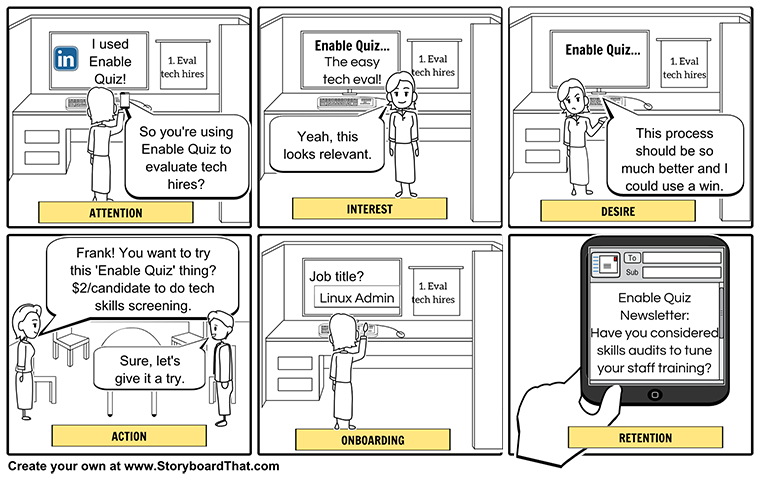 They offer lightweight online quizzes for managers to assess technical talent. You can see ‘Helen the HR Manager’ finding out about the product and starting to use it to screen candidates for new positions at her company. After completing the storyboard, fill out Customer Relationships and Channels asking yourself for each step of AIDAOR ‘Does this make sense? Can I visualize this working? How can I validate that?’. For more on storyboarding, you can try this Storyboarding Workshop. A body of work around ‘unbundling the corporation’ is closely associated with use of the Canvas. One of the propositions of that work was the idea that successful companies focus on operating against one particular business type: infrastructure, scope, or product. An infrastructure-driven business has a large fixed asset or system that it’s looking to sell to as many different segments as possible. A scope-driven business creates an ‘economy of scope’, doing a bunch of things for a particular type of customer. A product-driven business creates something unique and proprietary which inherently delivers a proposition relevant to one or more segments. Key Activities: Which activities are uniquely, strategically important to the business? Does that makes sense with the business type? Key Partners: Given the company’s business type, for which Key Activities should we be seeking partners? Happy hunting! Please consider posting a comment or dropping me a line and letting me know how it goes for you.